President Jovenel Moise wants more than just doctors from Haiti's cooperation with Cuba. During a recent visit to Cuba, the president aims to get more engineers as well to assist in the development of Haiti. Citing his development program, President Jovenel Moise said Haiti needs professionals other than doctors. He hoped that Cuba would continue to assist the country in the construction of hydroelectric dams and the training of engineers. 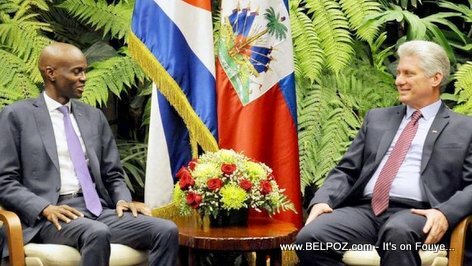 President Jovenel Moise said he asked Cuban president Miguel Díaz-Canel "what can be done to review the cooperation. This cooperation has allowed us to have 1,000 doctors trained in Cuba." "We are already working with the Cubans engineers in the current irrigation dam projects being constructed around the country," the president said, "15 Cuban specialists are currently working with 32 young Haitian agricultural engineers, training them so that when the Cubans leave, these young Haitian engineers will be able to take charge in the maintenance of these dams and the construction of future dams." Cuba has 242 rivers and they all have dams. Haiti has 274 rivers and only one of them has a damn, the Artibonite river in Peligre.